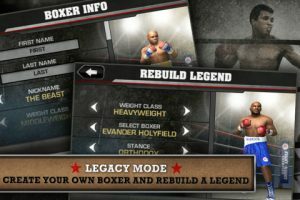 Similar to their work with MMA, EA Mobile has successfully brought a robust, home console fighting experience to the small screen. 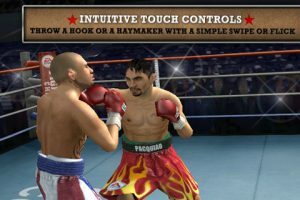 Complete with a smart and intuitive control scheme, scads of special features, and a roster of some of the world’s most legendary boxers, Fight Night Champion is a wonderful handheld experience. If you’re a fan of the Fight Night series on home consoles, its little brother lives up to the franchise legacy. I’ve fawned over EA Mobile’s accomplishments plenty in this space, but let’s recap. What makes the vast majority of their games so successful on the iPhone is their ability to not only deliver games with nearly the same production quality you’d see on one of the major consoles, but their uncanny ability to use the touch screen to benefit the game. While most developers are happy to simply overlay virtual buttons onto the screen, EA Mobile excels at utilizing tap, swipe, and tilt functions in intuitive ways. In Fight Night, the screen is divided into four invisible quadrants. 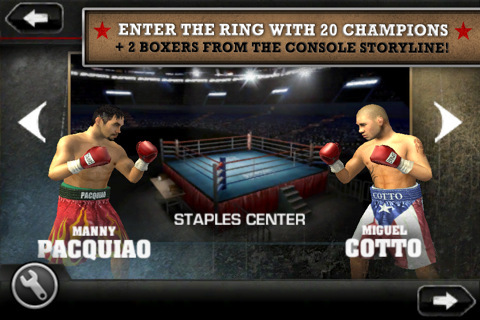 Swipe on the top of the screen, from left to right, and your boxer will perform a left hook to the face. Swipe on the bottom of the screen from the right to left and your boxer will perform a right hook to the mid-section. Use your finger to draw a check-mark on the screen and your boxer will perform his signature move. From there, the players are able to use both thumbs to block. Place your thumbs on top of the screen to block the face, and the lower half of the screen to block the mid-section. By holding down your thumbs and moving them both in the same direction, you’ll be able to dodge your opponent’s punches. There are about a half-dozen more advanced moves to use, but none of them feel cumbersome and – most importantly – you’ll never have to worry about keeping your thumbs on some virtual buttons. The Fight Night franchise has become the premiere boxing series on home consoles, and it’s due in no small part to its almost fetishistic treatment of boxing history. While you won’t get quite the level of detail in Fight Night Champion as you would on the PlayStation 3, it does include twenty different boxers from throughout history, a surprisingly robust boxer creation mode (called “Legacy Mode), and full audio commentary from Joe Tessitore. 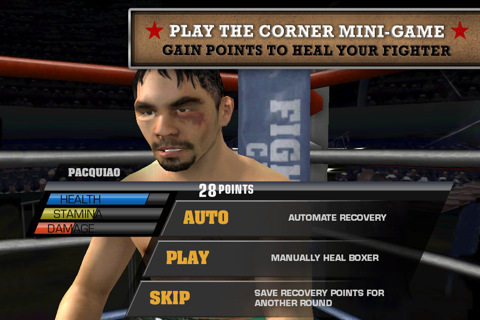 Fight Night is also known for its freakishly realistic graphics and facial animations. Again, while this game doesn’t meet the lofty heights of its console counterparts, it certainly packs an impressive punch. The legendary boxers are all there, looking like the real-life versions of themselves, and the action is fluid and nicely animated. 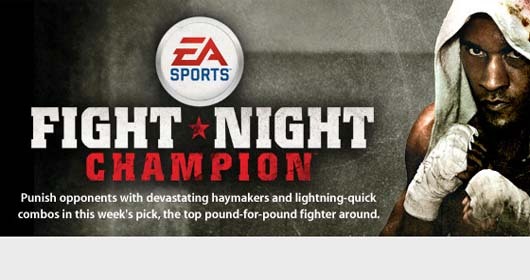 Bottom Line: Boxing fans looking for a quick one-two punch on the go need look no further than Fight Night Champion. 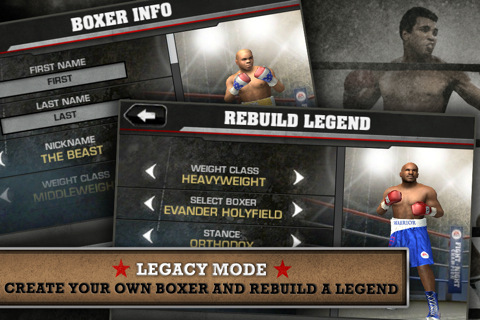 Fight Night Champion is compatible with iPhone, iPod touch, and iPad. Requires iOS 3.0 or later.